"After historic Texas flooding, officials will likely open more floodgates on Central Texas dam" was first published by The Texas Tribune, a nonprofit, nonpartisan media organization that informs Texans — and engages with them — about public policy, politics, government and statewide issues. Officials announced Wednesday that a woman was found dead at a low water crossing in downtown Llano, the second death as a result of this week's floods, the Austin American-Statesman reported. "The extent of the damage from the air of the flooding in #BurnetCounty is both breathtaking, and heartbreaking," state Sen. Dawn Buckingham, R-Lakeway, tweeted Wednesday after surveying the flooding from a helicopter. 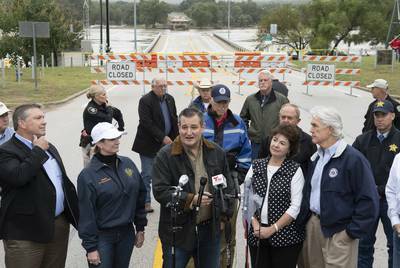 U.S. Sen Ted Cruz speaks as he views a washed out highway bridge during a tour of the Texas Hill Country on Oct. 17, 2018. Bob Daemmrich/BDP Inc.
At a briefing Wednesday, LCRA general manager Phil Wilson called this “a historic flood” and urged people, particularly those living along the Highland Lakes, to protect their safety. “This is a very serious situation and the dynamics are rapidly changing,” Wilson said. The LCRA monitors flood activity 24/7 from its River Operation Center in Austin. Officials have now closed Lakes Buchanan, Inks, LBJ, Marble Falls and Travis. Until the additional floodgates are opened, the City of Austin said it is unable to determine if any city streets will flood. Angel Flores, an emergency management spokesman for the city, said crews are on standby, monitoring the weather and any changes caused by opening additional floodgates. John Nielsen-Gammon, Texas' state climatologist and a Texas A&M University professor, said October typically brings heavy rain, due to a combination of cold fronts and warm water already in the air. He said extreme rainfall has become more frequent in recent years. Astrid Caldas, a senior climate scientist with the Union of Concerned Scientists, said there is a definite connection between climate change and heavy precipitation events. "We have seen a nationwide increase in heavy precipitation events," Caldas said. "For each 1 degree centigrade warmer in the atmosphere, it has the potential to hold up to 7 percent more water vapor, and then the rain has the potential to be heavier." Ed Janecka, county judge in Fayette County southeast of Austin, said floodwater released from Mansfield Dam is expected to reach La Grange by Saturday. He said the city is not anticipating any flooding but that he's monitoring the situation. Janecka said the dams are currently doing their job and that his only cause for concern would be if a lot of rain falls between Austin and Fayette County. La Grange Fire Chief Frank Menefee said his department is ready to respond if necessary and will do whatever they can to keep everyone safe. Known as Flash Flood Alley, Central Texas and the Hill Country are some of the nation’s most flood-prone areas, according to the LCRA. After water leaves the Mansfield Dam, it flows through Austin, Bastrop, LaGrange and down to Bay City before entering the Gulf of Mexico. Brent Lyles, executive director of the Colorado River Alliance, which advocates on behalf of the river’s health, said heavy water flow has both positive and negative implications downstream. However, Lyles said the primary concern during a flood event is always safety. People can sign up for updates from the LCRA Flood Operations Notification Service (LCRA FONS) regarding flood operations at dams along the Highland Lakes and Lake Bastrop. There is an option to sign up via a registration form or by phone at (512) 578-3246. The U.S. Geological Survey also has an application called Water On-The-Go, which allows users to locate stream gauges and water conditions near them. Disclosure: Texas A&M University and the Lower Colorado River Authority have been financial supporters of The Texas Tribune, a nonprofit, nonpartisan news organization that is funded in part by donations from members, foundations and corporate sponsors. Financial supporters play no role in the Tribune's journalism. Find a complete list of them here. After historic Texas flooding, officials will likely open more floodgates on Central Texas dam By Carlos Anchondo October 18, 2018 Across Central Texas and the Hill Country, heavy rain has led to catastrophic flooding in the past week. A bridge over the Llano River collapsed outside Kingsland on Tuesday and waters continue to rise, with homes flooding in Kingsland, Marble Falls and Granite Shoals. With more rainfall in the forecast, state and local officials are working to manage floodwaters before they move downstream. 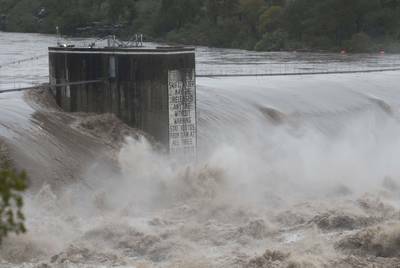 Eight floodgates are likely to open on the Mansfield Dam above Lake Austin as more rainfall is expected over the next few days. The Lower Colorado River Authority, which operates the Highland Lakes dams, calls the potential move “an unprecedented action.” Officials announced Wednesday that a woman was found dead at a low water crossing in downtown Llano, the second death as a result of this week's floods, the Austin American-Statesman reported. "The extent of the damage from the air of the flooding in #BurnetCounty is both breathtaking, and heartbreaking," state Sen. Dawn Buckingham, R-Lakeway, tweeted Wednesday after surveying the flooding from a helicopter. Along with U.S. Sen. Ted Cruz and U.S. Rep. Roger Williams, Buckingham met with constituents on the ground and observed damage to homes and infrastructure. A priority for Buckingham is to determine what resources will be required to rebuild the FM 2900 bridge near Kingsland, according to her office. In Marble Falls, 65 residential properties and two commercial properties have been damaged, according to Christina McDonald, the public information officer for the city. U.S. Sen Ted Cruz speaks as he views a washed out highway bridge during a tour of the Texas Hill Country on Oct. 17, 2018. Bob Daemmrich/BDP Inc. On Tuesday, Gov. Greg Abbott issued a disaster declaration for 18 counties. Mansfield Dam, about 20 miles west of downtown Austin, is designed to hold back floodwaters and temporarily store them in Lake Travis, according to the LCRA. As of 10 p.m. Wednesday, Lake Travis measured just under 700 feet, the sixth-highest level on record. Forecasters with the U.S. Drought Monitor said September 2018 was the wettest September on Texas record. Eight gates would be the most ever opened at one time. “They will remain open as long as the concern of flooding remains,” said Clara Tuma, a LCRA spokeswoman. Due to weather, the Austin Parks and Recreation Department has closed Barton Springs Pool and the Barton Creek Greenbelt. Water levels in the creek are expected to rise as a result of opening additional floodgates at Mansfield Dam, the Austin American-Statesman reported. At a briefing Wednesday, LCRA general manager Phil Wilson called this “a historic flood” and urged people, particularly those living along the Highland Lakes, to protect their safety. “This is a very serious situation and the dynamics are rapidly changing,” Wilson said. The LCRA monitors flood activity 24/7 from its River Operation Center in Austin. Officials have now closed Lakes Buchanan, Inks, LBJ, Marble Falls and Travis. Until the additional floodgates are opened, the City of Austin said it is unable to determine if any city streets will flood. Angel Flores, an emergency management spokesman for the city, said crews are on standby, monitoring the weather and any changes caused by opening additional floodgates. Homes in the Marble Falls area witnessed historic flooding after record rainfall in Llano and Burnet counties. Bob Daemmrich for The Texas Tribune John Nielsen-Gammon, Texas' state climatologist and a Texas A&M; University professor, said October typically brings heavy rain, due to a combination of cold fronts and warm water already in the air. He said extreme rainfall has become more frequent in recent years. “Climate change leads to more rain in any given event,” Nielsen-Gammon said. “The weather patterns we have are the source of things that lead to heavy rain.” Astrid Caldas, a senior climate scientist with the Union of Concerned Scientists, said there is a definite connection between climate change and heavy precipitation events. "We have seen a nationwide increase in heavy precipitation events," Caldas said. "For each 1 degree centigrade warmer in the atmosphere, it has the potential to hold up to 7 percent more water vapor, and then the rain has the potential to be heavier." Ed Janecka, county judge in Fayette County southeast of Austin, said floodwater released from Mansfield Dam is expected to reach La Grange by Saturday. He said the city is not anticipating any flooding but that he's monitoring the situation. Janecka said the dams are currently doing their job and that his only cause for concern would be if a lot of rain falls between Austin and Fayette County. “Everything is working fine up to this point,” Janecka said. “As long as LCRA does their job, what they were mandated to do, and they are doing it — we won’t have flooding here.” La Grange Fire Chief Frank Menefee said his department is ready to respond if necessary and will do whatever they can to keep everyone safe. Known as Flash Flood Alley, Central Texas and the Hill Country are some of the nation’s most flood-prone areas, according to the LCRA. After water leaves the Mansfield Dam, it flows through Austin, Bastrop, LaGrange and down to Bay City before entering the Gulf of Mexico. 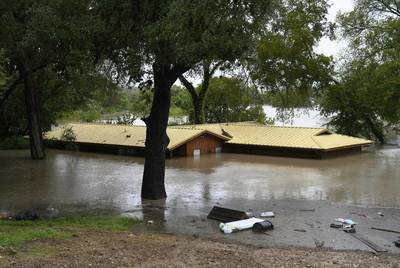 Floodwaters surge in the Colorado River and continue downstream from Marble Falls to Lake Travis and the Mansfield Dam. Bob Daemmrich for The Texas Tribune Brent Lyles, executive director of the Colorado River Alliance, which advocates on behalf of the river’s health, said heavy water flow has both positive and negative implications downstream. “On the good side, high water flow is part of a natural cycle,” Lyles said. “Pollutants, whether that’s trash or chemicals, get flushed out and it brings new water into the system. On the negative side, one of things that happens in heavy, heavy flooding is that local wastewater systems can sometimes overflow and whatever has been on the landscape gets flushed into the river.” However, Lyles said the primary concern during a flood event is always safety. People can sign up for updates from the LCRA Flood Operations Notification Service (LCRA FONS) regarding flood operations at dams along the Highland Lakes and Lake Bastrop. There is an option to sign up via a registration form or by phone at (512) 578-3246. The U.S. Geological Survey also has an application called Water On-The-Go, which allows users to locate stream gauges and water conditions near them. Disclosure: Texas A&M; University and the Lower Colorado River Authority have been financial supporters of The Texas Tribune, a nonprofit, nonpartisan news organization that is funded in part by donations from members, foundations and corporate sponsors. Financial supporters play no role in the Tribune's journalism. Find a complete list of them here. Read related Tribune coverage As Hurricane Florence bears down on East Coast, Texas faces flooding from Gulf Coast disturbance In wake of major floods, Texas water agency drafting statewide flood plan "After historic Texas flooding, officials will likely open more floodgates on Central Texas dam" was first published at by The Texas Tribune, a nonprofit, nonpartisan media organization that informs Texans — and engages with them — about public policy, politics, government and statewide issues. Link back to the original article, which is located at https://www.texastribune.org/2018/10/18/historic-texas-flooding-officials-open-floodgates-mansfield-dam/.